The history of Australian football can be traced to 1858 when Tom Willis, hit upon an idea of introducing football with a set of rules, so that Australian cricketers could be kept healthy in the bitter cold of the winters. The first Australian Rules football was played in 1858 in the Yarra Park on 31st July, 1858. Although it was only an experimental match, it saw Australian Rules football finally gaining impetus and emerging as a popular game in Australia. However, the first significant5 match to be played in the history of Australian football was the game between Melbourne Grammar School and the Scotch College on 7th August, 1858. 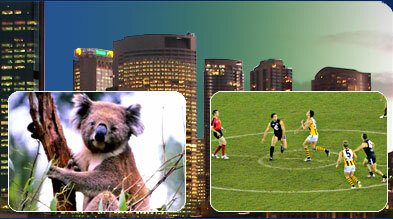 The game led to the foundation of the historical and grand Melbourne Football Club which subsequently contributed immensely in developing Australian football. The Melbourne Football Club was the first club in Australia to set down the rules for the Australian football, some of these rules survive to this day. The rules were set down in a historical event that took place in East Melbourne on 17th May and some of the eminent persons who contributed in drawing these rules were Tom Willis, J.B. Thompson, Thomas Smith and W.J. Hammersley. Initially Rugby school rules were set as a model on which to draw Australian football rules, but other members of the panel stuck to some more rigid rules keeping in mind the dry conditions in Australia and the age of the players. By and large, rules for Australian football were influenced by English university codes and the rules of football in English public schools. The final draft included only 11 simple rules which were required to be followed by the rules football players. The history of Australian football records that it was only in the year 1877 when Australian football gained league status as Victorian Football Association, the first league of the game was formed. For the first 20 years, Australian football was concentrated in Victoria but later it spread to Tasmania, Queensland, south Australia and in New South Wales. However, the first league in the history of Australian football could not survive in its entirety for long and in 1897 stronger teams broke away to form the Victorian Football League. As the new century ushered in it could be seen that the VFL was the more popular of the 2 leagues and it went on to gain more steam in 1925 when it had almost 12 members. The Victoria Football League ushered in the golden era for Australian football and during its long period the game gained international fame. However, financial crunches finally disrupted the league's smooth history in the 80's when more and more teams to shift base from Victoria and finally in 1989, the VFL became the AFL or the Australian Football League. AFL brought in an increasing number of non-Victorian teams like Adelaide and Fremantle to play the league. Today, Australian football scenario is ruled by the AFL and other leagues in the history of the game have acquired secondary status. The Australian football scenario is not bleak in countries outside Australia but the popularity there is not immense. The media has helped in spreading the game in other countries but it gained an immense popularity in Nauru, New Zealand and Papua New Guinea immediately after the WWII. Today this game has become quite popular also in the US, Canada and Japan which has given rise to another international league known as the Australian Football International Cup.